Here's a list of all of the GORGEOUS ribbons in this month's Ribbon Club Assortment including a link to each one: 3/8" Quatrefoil Print on Shocking Pink Satin Ribbon, 5/8" Checkerboard Satin Ribbon, 3/8" Pink and Purple Bold Diagonal Striped Grosgrain Ribbon, 5/8" Diamond Satin Regal Purple, 5/8" Vintage Floral Print Satin Ribbon, 5/8" Delicate Stitched Satin Shocking Pink Ribbon, 3/8" Vertical Striped Grosgrain Mixed Pink & Purple Ribbon, 5/8" Double Faced Satin Hyacinth, and 3/8" Shell Print on Regal Satin Ribbon. All of these lovely ribbons can be used for Summer projects, and all year long. They are absolutely beautiful! This little butterfly bow was created using a sparkly vinyl fabric sheet cut into the shape of butterfly wings, and carefully attached to a French Clip. The butterfly wings include pieces of 5/8" Vintage Floral Print Satin Ribbon, 3/8" Quatrefoil Print on Shocking Pink Satin Ribbon, the base is wrapped with and 3/8" Shell Print on Regal Satin Ribbon, and the "antennas" were made using the adorable 3/8" Vertical Striped Grosgrain Mixed Pink & Purple Ribbon. I also wanted to make a card using some of these fabulous trims, so I put this card together. I used Echo Park patterned papers and journalling card, a vintage dairy bottle cap, a Prima wire butterfly, and some Tim Holtz Distress Inks on the edges of the paper. I ran a width of the 5/8" Vintage Floral Print Satin Ribbon, as well as 3/8" Vertical Striped Grosgrain Mixed Pink & Purple Ribbon, across my card as borders. I also created a lovely bow using some Baby Pink Seam Binding, Peacock Alley Seam Binding, Ivory Burlap String, and one of the sweet trims from this month's Ribbon Club Assortment called 3/8" Quatrefoil Print on Shocking Pink Satin Ribbon, and I topped that with a 25mm Open Rose Pale Pink With Hot Pink Center, as well as some Sweetheart Blossoms in turquoise, mixed blues, ivory and mixed pinks. I also tucked in some adorable Pink Double Head Stamens, Baby Blue Double Head Stamens, and some Teal Double Head Stamens and White Double Head Stamens (temporarily sold out). 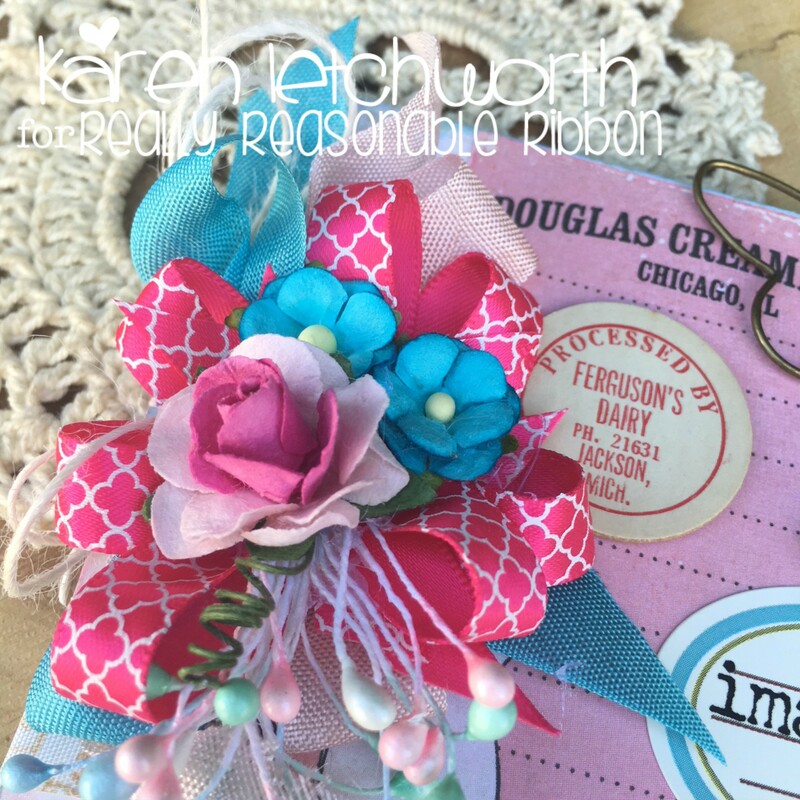 There are so many ADORABLE Mulberry Flowers, Embellishments and trims at Really Reasonable Ribbon to adorn ALL your projects. Thanks so much for stopping by. 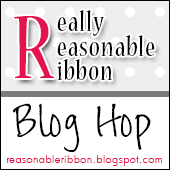 Your next stop on this hop is at the blog of my awesome teammate, Kathy. I hope you enjoy her project. 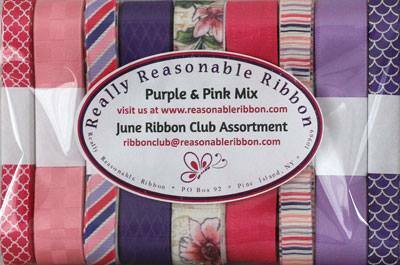 Don't forget to answer the question on the RRR Blog at the end to be eligible for the prize, which is this month's Ribbon Club Assortment. Before I run off...I want to mention that the Double Head Stamens at $1.99/bundle of 160 pieces, are selling out quickly (some colors are already unavailable) so I'd suggest grabbing these today while you can. They're SO pretty, and add SO much personality to your flowers, bows, etc. Today is a great day to treat yourself. I adore your beautiful butterfly barrette! Simply gorgeous. And the card is gorgeous, too; love the vintage style of it. Love your butterfly clip and card! Beautiful projects! Gorgeous butterfly bow and sweet lovely card!! That butterfly bow is so cute with this month's ribbon collection colors. What a sweet creation. Your card is so bright and pretty. I love the little sweetheart blossoms. Once again Karen - you nailed it on your creations here! Super lovely as always and love that butterfly! Creative! 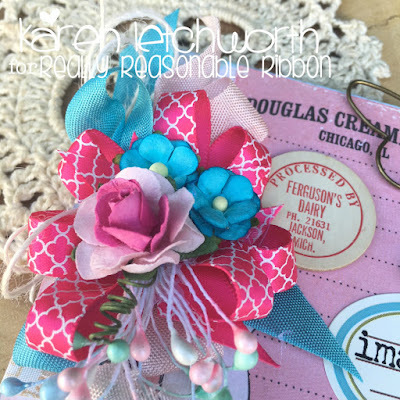 Oh Karen what a beautiful clip and card - I really love this selection of ribbons - the colours really appeal to me, and your projects have really shown them off to perfection! Your butterfly is such a pretty little creation I'm waiting for it to fly off the page! Your card is bright and fun such lovely projects tfs. I was stopping by to leave a comment about the lace package that you sent, and saw your blog hop post. I could have sworn that I stopped by here the other day, but I guess my seizures have messed my head up more than I thought. I had to stop in the middle of the hop, and I guess I picked up without coming by here. please forgive me for missing your post. anyhow, I am here now to tell you how much I love that wonderful butterfly bow! it is fabulous! you always come up with such neat ideas for those. :) your card is full of so many cute bits and embellies as always. 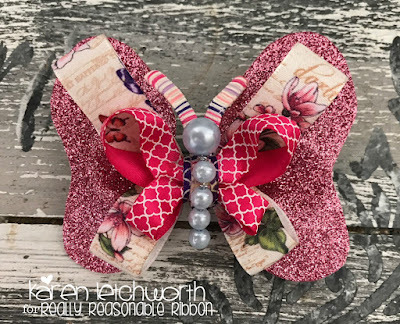 Adorable butterfly bow and pretty card. Such a cheerful combination of colors! Nice!